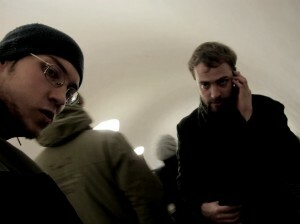 the wozzeck project started in september of 2007. its primary members are ilia belorukov and mikhail ershov. in the beginning, when pavel miheev played drums, wozzeck had it’s roots in free-jazz, noise and ambient-drone. a year later wozzeck became a duo and musically transformed into an extreme noise project based on unidentifiable sounds of saxophone and bass distorted by pedals and laptop. in the summer of 2009 drummer alexey zabelin and guitarist pavel medvedev joined wozzeck to experiment with math-metal riffs, noise and free-improvisation all framed in compositional way. currenty the project work both as a trio and as a duo. in duo form belorukov and ershov are transitioning towards improvised electroacoustic and noise music.